A gifted fencer, currently studying at The Sixth Form College, Solihull, has returned from the Under-17 (Cadet) European Championships in Bulgaria with a silver medal. 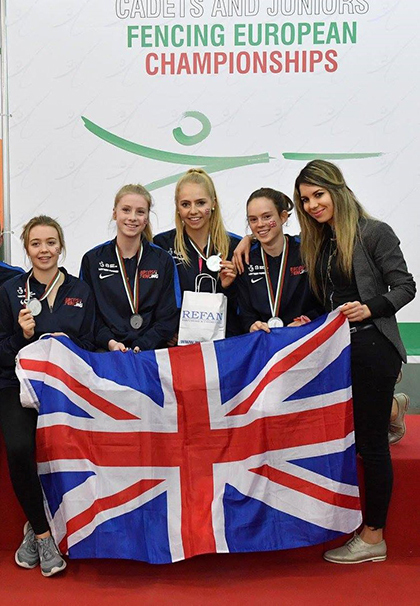 Alexandra Powell (aged 16, from Hollywood) was part of the Great Britain Women’s Epee team which finished second, the first time such a team had medalled at this major competition. They had to build up a ranking from previous internationals during the season and went even better than the 5th place in Copenhagen and a 4th position in Luxembourg to win the silver medal. Alexandra has been fencing since she was 8 years old and has represented England at Under-15 level and Great Britain at Under-17 level previously. The ex-Woodrush High School students fences for several clubs, including Kenilworth Sword, Malvern Hills and Birmingham Fencing and she occasionally even travels down to London so she can train at the highest standard possible and stretch herself. Alexandra represented England Under-15s at an international in Poland when she was just 14 years old. She came 16th out of 150 fencers at that tournament. Since then, she has been selected to represent Great Britain in Germany, Slovakia, Denmark, France, Austria and Luxembourg for the Cadet Under-17 team. Her selection for Great Britain at international tournaments came through competition, which accrued her enough points to be ranked second in the country. Her selection for the European Championship came from points gained at these international, with only three fencers being selected to go onto the European Championships. Alexandra is currently juggling her fencing training with her A level studies in Physical Education, Psychology and Law. After college she plans to take a gap year to concentrate on fencing training and competing. Possible career paths she is considering include public services such as the police, ambulance or fire service.